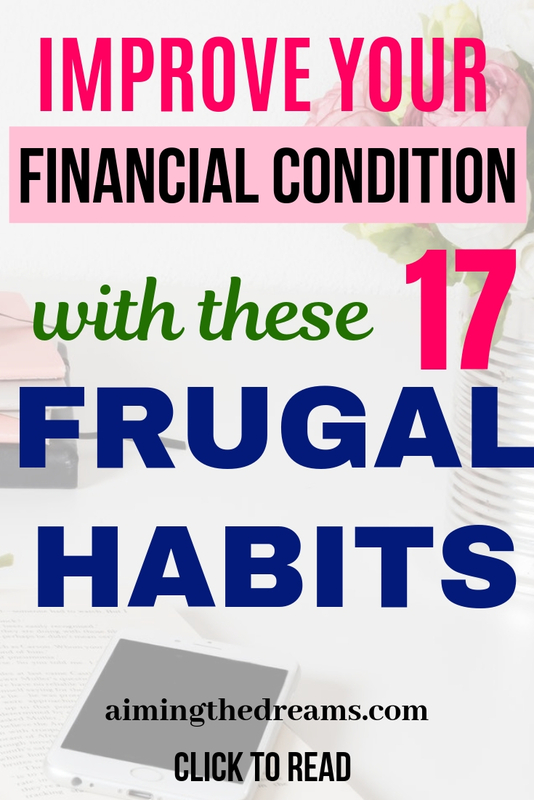 These frugal habits for better financial condition improves your personal finance. Your wealth grow when you learn how to use your money properly . The three pillars of finance are earning, saving and investing. Spending is required for only those things which are needed for better health and better family life. Disclaimer: This post may contain affiliate links which means if you click on link and make purchase, I may get compensated with no extra cost to you. 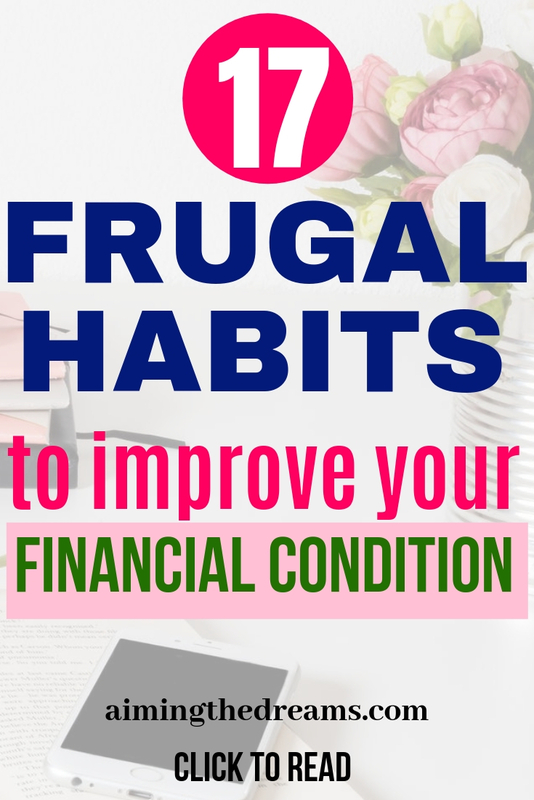 There is no chance of controlling your finances without creating a budget. 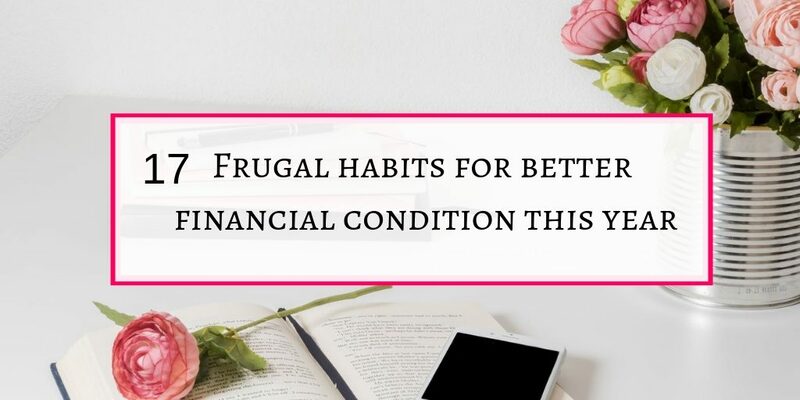 And before creating a budget, you need to track your spending. It is important to know the path of your cash flow. Budgets work when you are really serious about your finances. This way, you know from where you can squeeze money to save. Money saved is the money earned. Starting a side hustle diversify your income streams if you are already working. It also helps parents staying at home to earn some income. Everybody have some kind of craft or hobby but it would be really great if you can turn your hobby to a side hustle. Some people have made their side hustles a full grown business. If you are good at words you can start proofreading. Learn proofreading here. You can start a transcription side hustle. Learn transcription here. Maintaining health is required for happy life. But you don’t need to spend a lot on food. Just eat mindfully , a simple seasonal food and you are done. Wherever possible, cook your food at home. When you cook your food from scratch, you know which ingredients you are using and how much. You and your wallet, both will be healthy. Grocery is a big expenditure. Ultimately food or basic necessities are very important. And believe me, without a list, most of us have tendency of buying everything else but not the necessary stuff. If you don’e have list, you just go and look on supermarket aisles for inspiration “what to buy”. Mind gets confused and buy those things which you even don’t need. O wow, what an incredible job these cashback sites are doing. I just love the idea of getting cash after shopping. If you love online shopping then don’t leave this money on the table. Grab that money and try to shop through these cash back sites. Living on less doesn’t need to be boring. You can really enjoy your life without spending huge amount of money. Go for free entertainment. If you already have internet, you can watch Youtube videos. Everything is there. Watch free to air TV. And go for outing that doesn’t need to get tickets. Go to library and read free books and magazines. These are small expenses but if you will count the money, you will be amazed how much you can save from these. Compounding is considered a magic in money terms. Money grow without you doing anything. And it is nice to have more money without earning. Investing can do magic for you but you need to have some basic knowledge of investing. Read books on investing and trading and only then go this route. Because sometimes it is bit risky. If you will not track where money is going, you will not be able to save enough. Saving every dollar which get wasted on unimportant things will give you some amount to save. All of us know the importance of tracking our goals and setting . But financial goals are overlooked. Make financial goals and track those goals. Analyse your finances every 3 months and make required changes. Before making any big purchase, ask yourself you really need this or you can wait for some time. In the meantime , look if you can find that thing on low price. Never buy on a whim. Because it is a big purchase and will take a big chunk of money from your pocket. You have to look for things that may be recurring fees. I happened to me last year. I had a bank account that I was not using but I was paying a fee of 4 dollars every month. That made me pay 48 dollars in a year. I closed that account otherwise I would have finished all the money in that account. It is better to look for banks that operate bank accounts without fee. Unused subscriptions are of no use. If you have magazine subscription, gym membership or other memberships which you never use, just cancel them. If you cannot find time to use those subscriptions today, it is highly that you will not have time for them tomorrow. Instead of keeping those memberships, use that money to save for future. If you have friends who love to spend money a lot. 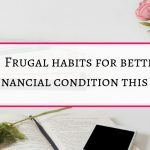 You will be tempted to spend but with frugal friends, you will try to save and be frugal like them. Some people like to spend money and feel happy that way. This should not be the case. Create happiness with good relationships and be happy with your own self. Whatever you are earning, make a habit of saving some money. Keep some percentage for saving then start your budget. This way, you will have that money set aside even if you earn less. Saved money will not be available for expenses. Everybody have some kind of hobby or craft. Turn that into your side hustle and earn money. If you have some skill of craft, you can sell your crafts on Etsy. Some people have very expensive hobbies and they become masters of that. Instead of spending money on your hobby, earn money from that hobby by teaching others or making products and selling. You can either save money by earning more or by saving whatever you have. Instead of living a life king size and buying everything you want, try to live below your means. You don’t need to have lot of flashy things to show people, you just need to live a fulfilling life. If you are having good amount of money now, keep it for future.Never spend all of your money once you get. Living below your means and earning money wherever possible is the key to save money. These are the ideas I myself practice o save some money. It is not rocket science but simple small habits that leads to save money and grow your wealth. Please share these ideas by sharing this post. I will be really thankful to you for this.